With huge publicity done on Windows 10 via reserve and get Windows 10 apps on most Windows 7 and Windows 8.1 PCs all over the world, Microsoft can be sure that more Windows enthusiasts are chasing the latest builds of Windows 10 available, including any leaked versions. The latest unofficial Windows 10 build that is leaked is 10134. 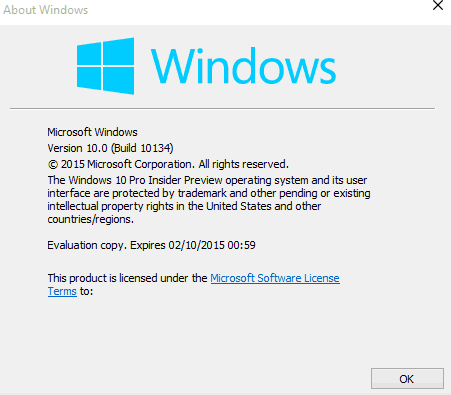 Only English and 64-bit (x64) edition of the Windows 10 Build 10134 leaked for now, and it comes in an ISO image with the name of 10134.0.150530-1700.WINMAIN_PRS_CLIENTPRO-CORE_OEMRET_X64FRE_EN-US.ISO. As shown in the name of ISO image file, the build 10134 floating on the Internet now is not from fbl_impressive branch, which is the branch which all Windows Insiders subscribed to. Instead, the build 10134 leaked appears to come from winmain_prs branch. The winmain_prs branch is a branch of winmain, the main Windows development branch, and is used by Microsoft to provide and share current development builds to a select group of Microsoft’s closest partners. The new leaked builds appears to be more stable than Windows 10 Build 10130, which was officially released by Microsoft, and comes with several settings and apps that do not exist previously. Do note that you may need to reset the branch which you’re on after installing this to receive future updates from fbl_impressive branch. Windows 10 Build 10134 was signed off on May 30th, 2015 so by now Microsoft already has newer builds available, such as build 10135, 10136, 10140 and so on. In addition, most of the changes will be in term of bug fixes and code tweaks, as Windows 10 development is now more or less feature-freeze. Windows 10 general availability (GA) date is on July 29th, 2015, and its RTM date is expected to be much sooner.